The standard German infantry weapon was the rifle, originally designed by Mauser and dubbed the Karabiner 98k. This weapon was a 5-shot, bolt-action rifle that actually dated back to 1898 when it was first adopted by the Imperial German Army. It was standard issue for German troops in WWI and, in its modified 98k version (k for kurz, or short), in WWII as well. While the German standard rifle was a bolt action rifle, the Germans did attempt to design a successful automatic rifle as well. Two designs were submitted for trials in 1941, one by Walther (the maker of the famous PPK and the P38 pistols), and the other was submitted by Mauser. The Mauser design won out over the simpler Walther design and many thousands of the Gewehr 41(W) were made available to the troops on the Eastern Front. After initial use, results were less than satisfactory and as soon as a better design came along (the model 43), production was halted. The way in which German troops used their weapons changed and a rifle with a range of 2000 yards was no longer needed - except for specialists and snipers. Instead, ranges had shrunk down to 400 yards and a less powerful cartridges was needed. The most common submachine gun used by the Germans during WWII was the MP40. Many times the term "Schmeisser" is used in reference to a German submachine gun. While it is true that the Schmeisser firm did create and produce its own submachine gun design, it was less than perfect and prone to trouble. The MP40 was a not manufactured by Schmeisser, and the weapon was far more simple and had a much more cleaner design, thus it became the standard issue for German troops. An earlier design called MP38 had a similar appearance and saw widespread distribution. A less known model called Erma was also produced as well as a German copy of the British STEN gun, called MP3008. The Waffen-SS used a submachine gun made by Bergman called the MP34 also. The next submachine gun design to emerge was the MP43 or Machine Pistol 43 from a design developed in 1943. It fired a less powerful cartridge and had a lighter recoil as a result. However, Hitler, still thinking that troops needed a weapon capable of firing 2000 yards, ordered that production of the weapon not start. The German arms minister, however, knew the need of the new weapon, and changed the name to "Machine Pistol", which is what the Germans called their submachine guns like the US Thompson .45 cal. The trick worked and the weapon went into production at three factories and German troops all over the Eastern Front were clamouring for the new weapon. The whole affair was blown" when a few divisional commanders asked Hitler at a conference when they would get the new weapon. Hitler was furious and ordered an investigation. Luckily for the men that had disobeyed the Fuehrer, the results of the investigation were so encouraging about the new weapon that Hitler changed his mind and announced that henceforward the weapon would be called "Sturmgewehr" or Assault Rifle. This was the world's first ever assault rifle. The Maschinen Pistole 43's origin was actually the Maschinen Karbiner 42 (MKb 42). It looked a lot similar, and was issued in numbers on the eastern front. Later, this weapon was refined into the Mp43. The Germans, contemplating the sniping value of the Mp43, made a variant, called the Mp43/1. It had scope mounting rails on the iron-sights. The sniper arrangement didn't really work, so, few were made. In late 1943, the MP44 (the most commonly found German assault rifle from the war) was developed, though being basically the same thing as it's predecessor. In 1945, Mauser had begun work on a new type of assault rifle (sometimes called the StG45(M), sometimes the Gerat O6), that used a roller-locking mechanism (like that of the Mp5), which slowed the ROF down to 450 RPS. However, these rifles never made it past the prototype phase. The Germans settled on two light machine gun designs and used them throughout the war, the MG34 and MG42. The MG42 went on to become the standard design for a light machine gun for NATO and is now used in a more modern form by the US military, and the Australian Army, as the M-60! The new German Army continues to use a less modified but still modernized version of the MG42 as their standard light machine gun. 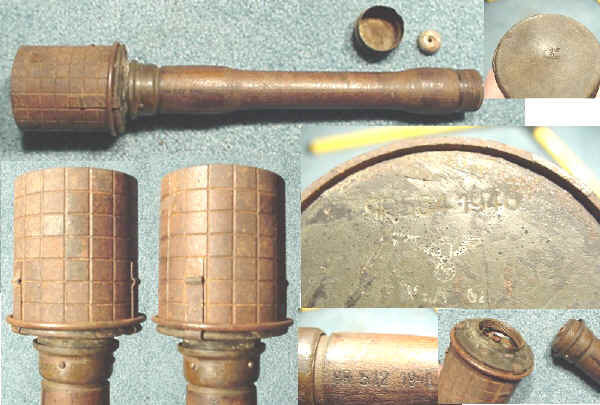 The "potato masher" grenade from WW1 made a comeback in an improved version. The famous "Luger" pistol was used in WW2 in a shorter barrelled version from WW1. Most Artillery (Long) P08 and Marine P04 had, due to Allied restrictions, to be shortened to a barrel length of 100mm. (Same for the C96). The P08 manufactured after 1935 had the same dimensions then as the pre 1918 P08 Pistols. Interestingly the Germans never referred to it as a Luger but by it's proper name the P08 Parabellum. Mauser Schnellfeuer-Pistole These odd-looking pistols (see picture above) were based on the Mauser C96. These were more "flashy" than effective. It was wasteful of ammunition and difficult to aim. The weapon has a protruding 20-round magazine and detachable wooden stock/holster. (When dis-assembled the pistol was housed in the stock) Could fire 900 rounds per minute (15 rounds per second) but because of it's extreme lightweight was nearly impossible to aim with any accuracy. Also a weapon that empties it's magazine in just over 1 second may not be the best option. The Panzerfaust was an effective, 1 man, shoulder fired anti-tank weapon.